This recipe does not fall into the 30 minute criterion of this site. 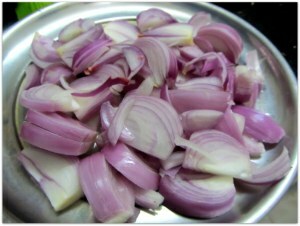 However Diwali is a special occasion, so a little bit more time in kitchen will not hurt anybody. After I left my home town I missed Biryani like any other Bengali. Whenever I had an opportunity I used to visit Bangalore and try Kolkata style Biryani at Lazeez in Commercial Street. Then my requirement of visiting Bangalore ended, and ever since I missed my Biryani. My hubby went one step further, he ordered Biryani at any shop, whoever had one to offer in their menu and in every case (other than at Dindigul Ponram Biryani) he did not go beyond a spoonful. I had to try my hand at it. After trying for three long years I finally mastered the art of Kolkata style chicken Biryani and here I share my wisdom with my fellow Biryani lovers. Let’s begin! 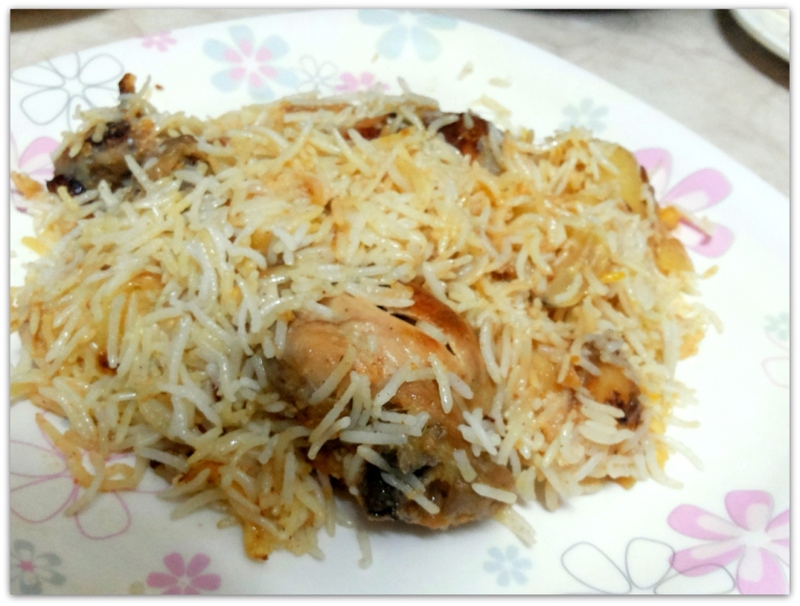 I have tried a lot of biryani recipes but it never was as good as a real Kolkata style chicken biryani. Then I found this recipe and tweaked it to my advantage. The following is the recipe for two people. I will explain how to prepare each of them one by one. While cooking you can obviously multitask, like while the chicken is cooking you can start cooking your rice etc. 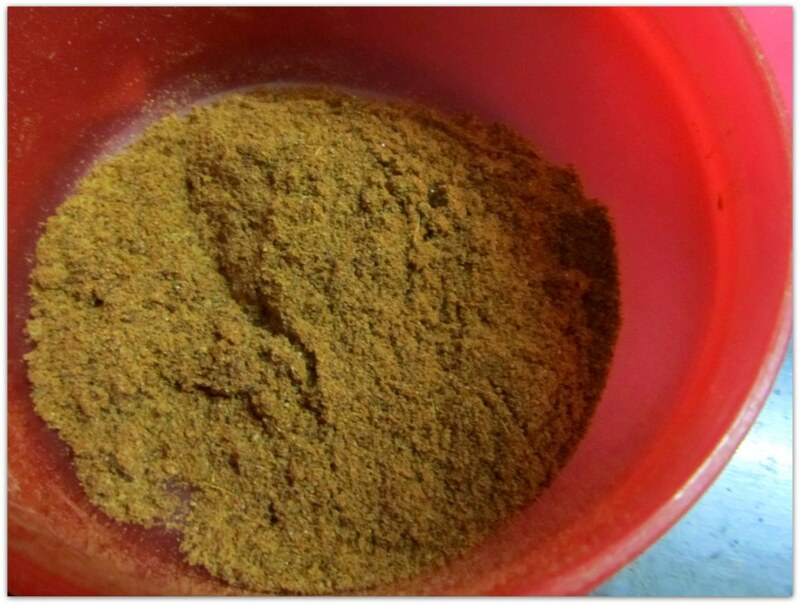 Biryani spice-mix is the soul of the prep. The amount you will get from the ingredients listed below is a lot, and can be used to make biryanis many times over. However, it is easy to make larger amounts. 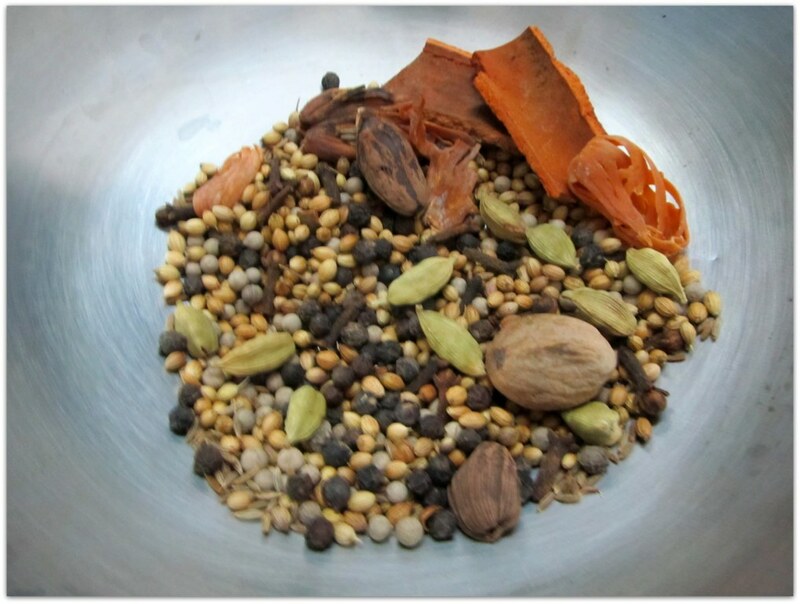 This spice-mix can be used in daily cooking as garam masala. 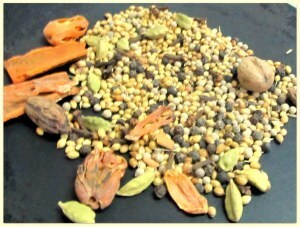 Dry roast all the whole spices on a hot tawa, till they start to release their aroma. Take them off the heat and let them cool a little following which blend them to get the powdered spice. You can sieve coarse grounded spices to get finer powder if you wish. Keep the powder in an air tight container for longer use. You need to have some good quality Basmati rice. If you use aged rice even better. Wash the rice under running water and then immerse them in water for at least half an hour. 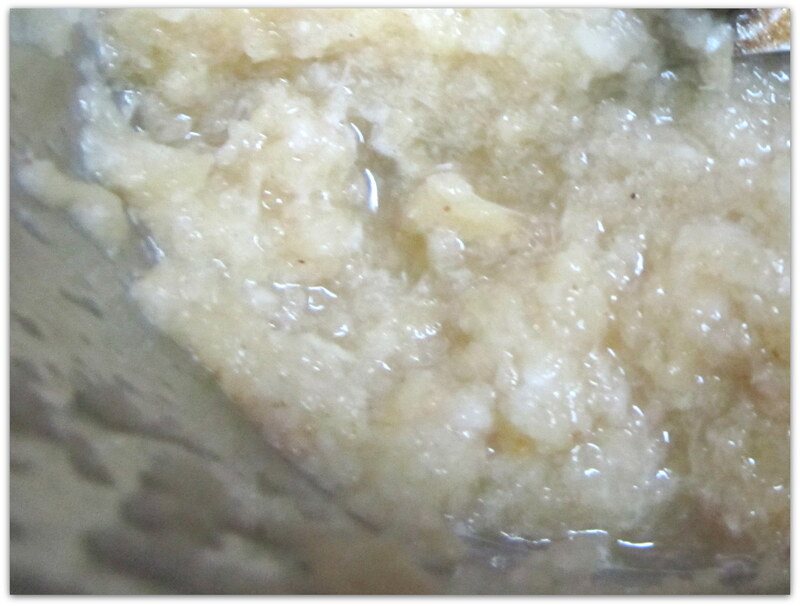 This will get rid of excess starch, resulting beautiful non-sticky rice grains. To prepare the rice, take 4 or 5 cups of water in a pan and bring it to a boil. Add couple of green cardamom, 1 clove and a cinnamon stick. Add a pinch of salt. When the water starts to boil, add the rice and cook till it is done. Drain the extra water. 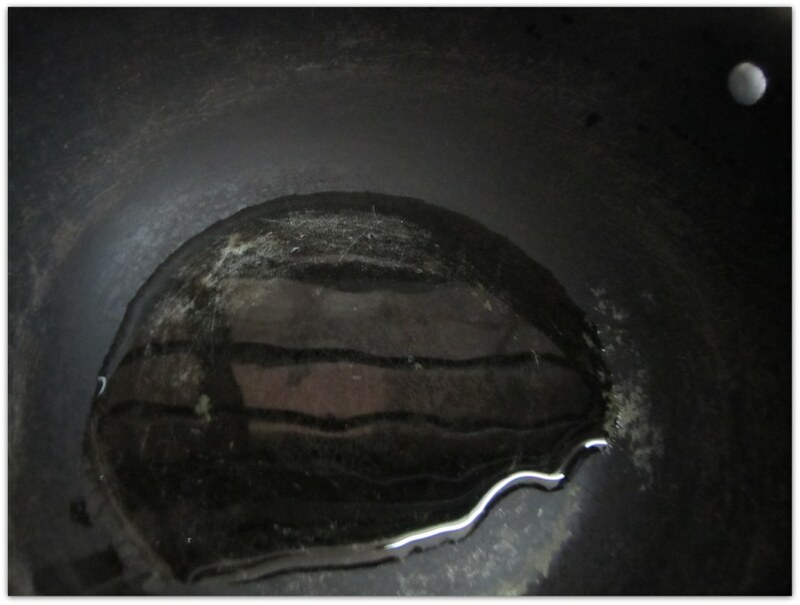 Clean under running water to get rid of excess starch and salt. Take a flat plate and spread the rice. 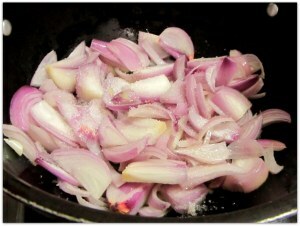 Cut 4 or 5 onions and fry them with a pinch of sugar in 2 tbs of oil till they caramelize. 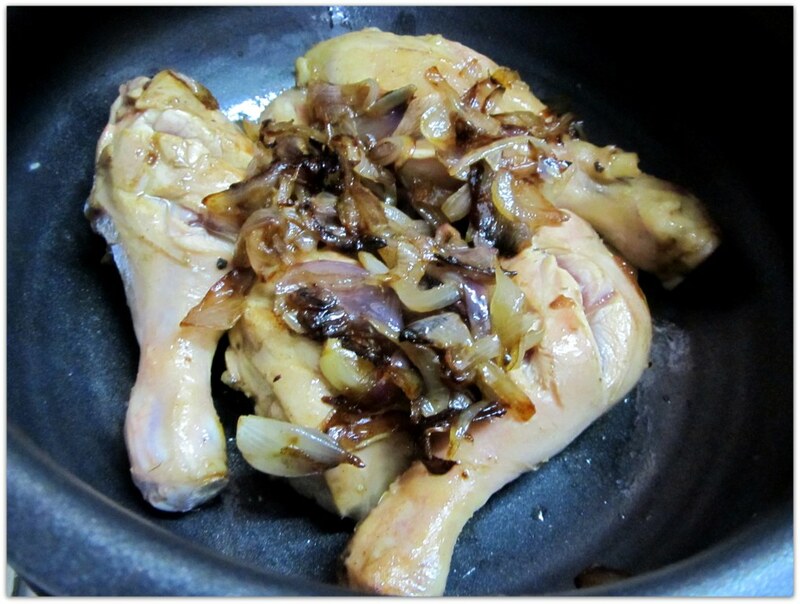 We will use half of the onions to cook the chicken and half for assembling the final dish. We will need a lot of garlic for this dish. The ratio to ginger and garlic should be approximately 1:3. 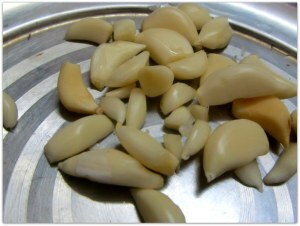 After you peel the garlic and ginger blend them in a blender with a spoonful of water till you get a smooth paste. 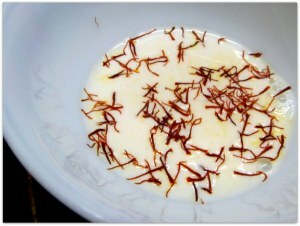 Take 2 spoonful of warm milk (or water) and add a pinch of saffron strands and keep it aside so the milk gets the color. 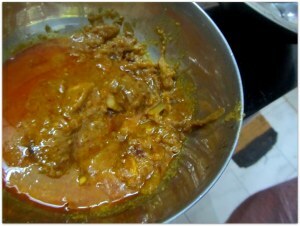 If you do not have saffron handy then take same amount of water and add a pinch of turmeric. The effect will be the same. 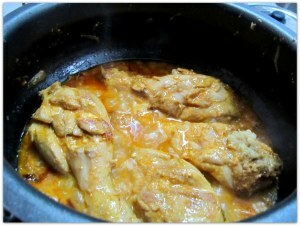 But be careful, do not add a lot of turmeric, it will ruin the aroma of the dish. Wash the chicken pieces and pat them dry with a kitchen towel or clean cloth. 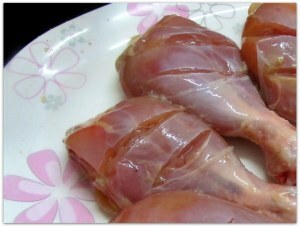 I usually use whole leg pieces for this preparation, as they taste better. Heat 2 tbs of oil in a pan and sear all the chicken pieces. Searing means, frying all the sides till they start getting a golden color. This also seals the moisture in the meat. This also stops the meat from releasing a lot of water while cooking. After the chicken pieces starts to get a golden brown color, add half of the fried onions, all the ginger-garlic paste, plain curd, 1 tbs biryani spice-mix, 1 tbs red chili powder, 2 tsp rose water (if you are using rose essence then use 1 tsp), 1 tsp Keora water and salt. Mix well and bring it to a simmer. Reduce the heat and let it cook for at least 20 mins. Check occasionally, if required add a little water. We do not want a lot of gravy. When done take the chickens off the heat and keep them in a separate bowl. We will use the pan to fry the potatoes. We will use the chicken pieces and gravy separately. You can sieve the gravy to get rid of all the chunky pieces, but I am too lazy to do that. 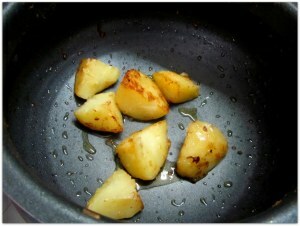 Take two potatoes, cut them into four pieces each and cook them in a pressure cooker with a pinch of salt. When done keep them aside. 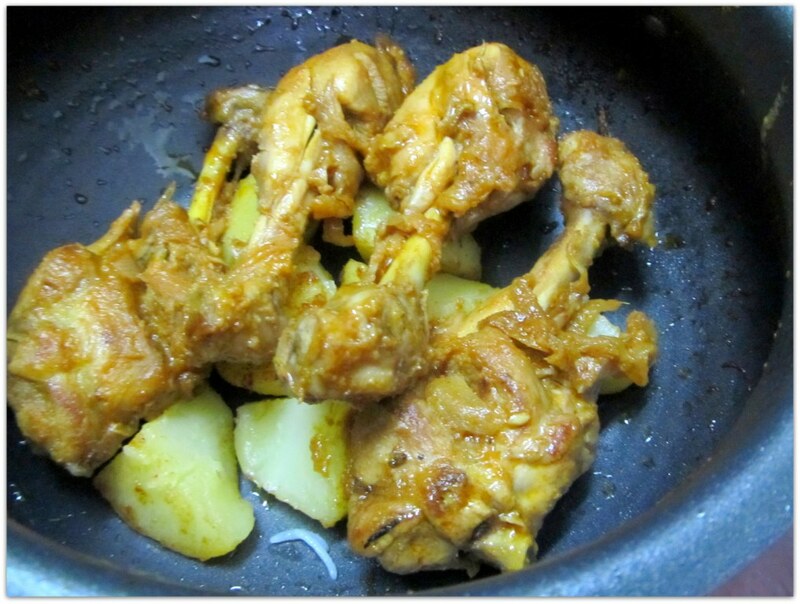 In the same pan, after finishing the chicken, fry the boiled potatoes till they start to acquire some golden color. Turn off the heat. It is now time to assemble all the pieces to get our Holy-Grail. Now that we have all the elements of biryani ready, we just need to assemble them. Since we are going to cook the biryani on a low heat for a long time, we need to use a heavy bottom pan; else there is a possibility of burning the lower portion which eventually sticks to the pan. In the pan put the potatoes, chicken legs at the bottom, top it up with 2 tbs of gravy, some fried onion and a pinch of biryani spices. Now add a layer of rice. Top it up with fried onion, 1 tbs of gravy, a pinch of biryani spice-mix and 1 tsp of saffron water (or milk). Put another layer of rice. 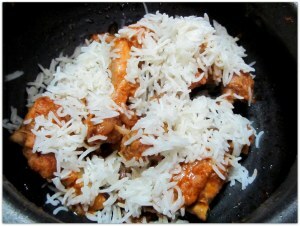 Top it up with fried onion, 1 tbs of gravy, a pinch of biryani spice and a tsp of saffron water (or milk). Add the last layer of rice. Top it up with fried onion, a pinch of biryani spices and 1 tsp of saffron water (or milk). Finish it with a dollop of ghee 🙂 . Cover the pan with a lid. Try to use a pan with a fitting cover. We want the aroma to be sealed as much as possible. Put the pan on low flame and cook it for 10 mins. Turn off the heat and let it rest for another 5 mins. Your Biryani is ready to serve. Immerse the rice in water for at least 30 mins. Cook the rice in boiling water with a pinch of salt and some whole spices. Cut the onions and fry them in lot of oil. 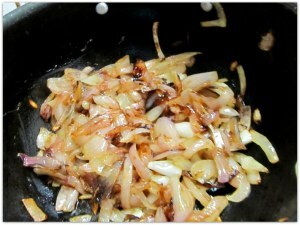 We need nicely caramelized onions. Cut the potatoes in big chunks and cook them in a pressure cooker till tender. Fry the potatoes in the same pan after you remove the chicken. How to identify aged rice? Its usually mentioned on the pack. 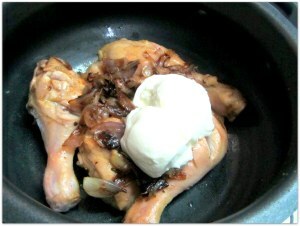 Your recipe is really easy to follow and the step by step pictures make it even interactive. 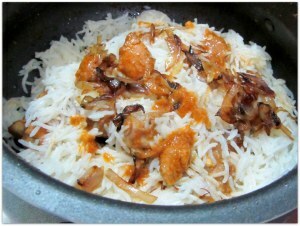 I have started blogging recently and my first post is of Kolkata biryani. Please check my recipe also. It doesn’t need much special ingredients. One can prepare it with easily ingredients available in local grocery. which brand of zaferan (saffron) do you suggest? i’ve seen all local brands don’t bring the same sort of royal aroma what generally expensive brands manage to fetch easily. .thanks for sharing this delicious recipe. I really enjoyed it and its very helpful .. Keep it up !! If you check my recipe, I have not used any of the ingredients you mentioned (Star Anise, Kabab Chini, Khoa kheer and Alubalhra). however everybody has their own recipe. If you are going to try mine, I hope you like the end dish. You made my dream true. I cant believe i have prepared kolkata biriyani in my house at bangalore. I am a big fan of kolkata biriyani and this is like my dream come true. I made it so perfect. same essence, same teast…. just perfect. Thanks a lot. 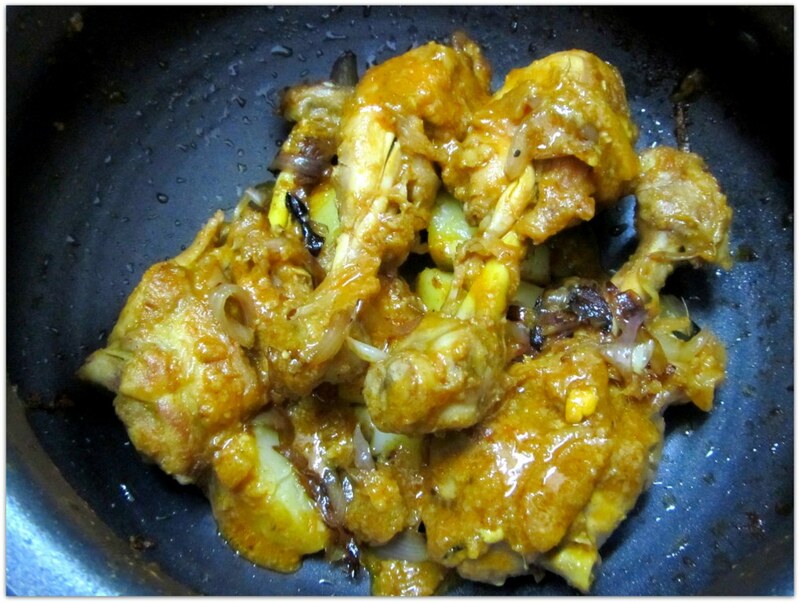 Hiii sharmistha aunty..i am 18 years old.I tried your recipe & i think ….east or west yours this recipe is the best…. Thank you Tanusree for trying my recipe. It feels good to know that I was able to make a fellow Biryani lover happy. However one small correction, I am not the famous Sharmistha Dey from the the show Randhuni. Thanks again :). Haha. Doesn’t matter. Your recipe seems very precise and exciting. I am gonna try out this weekend and get back to you. What I loved about it is the simplicity. Thank you Abhishek :), let me know how it went. 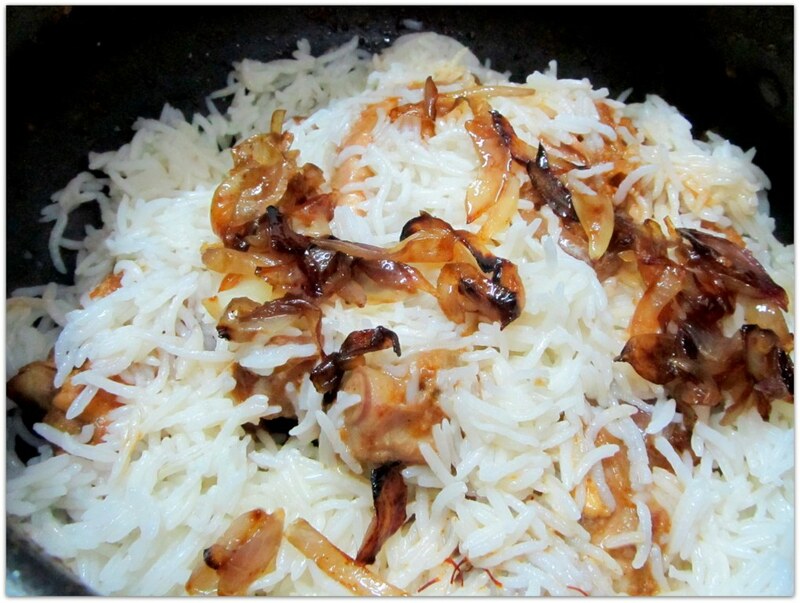 Hi Sharmistha, the biryani went good for me, but I think I can better it more with time… Thanks for the recipe! Hello !! Yesterday, finally I cooked biriyani. Ur recipe was helpful. Thanks for sharing. Hi Sarmistha, your biriyani recipe really did well for me. Thanks for it. I am going to prepare your recipe tomorrow. 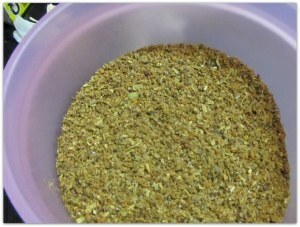 Do I need to prepare more of biriyani spice mix if I amount of rice is 5 cups? 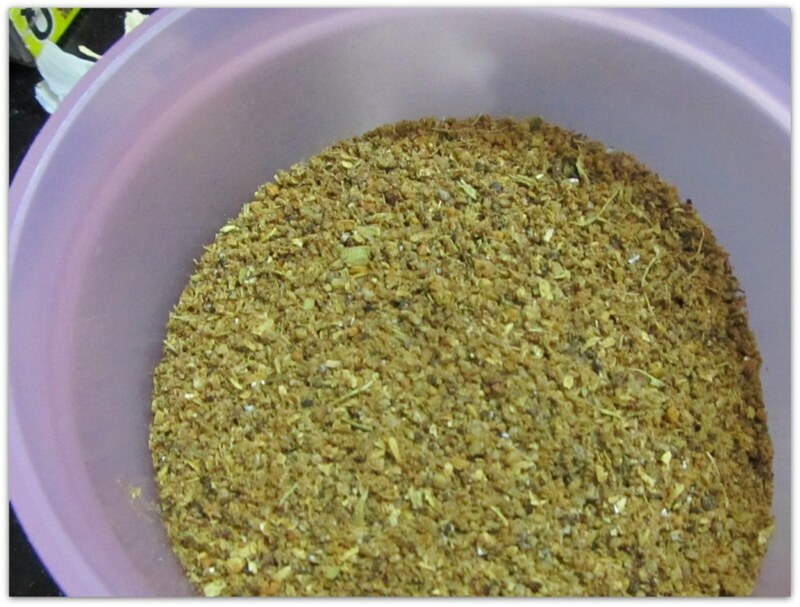 sorry for the late reply, I guess you have already found out that the amount of spice mixture will be a lot and can be used many a time more. 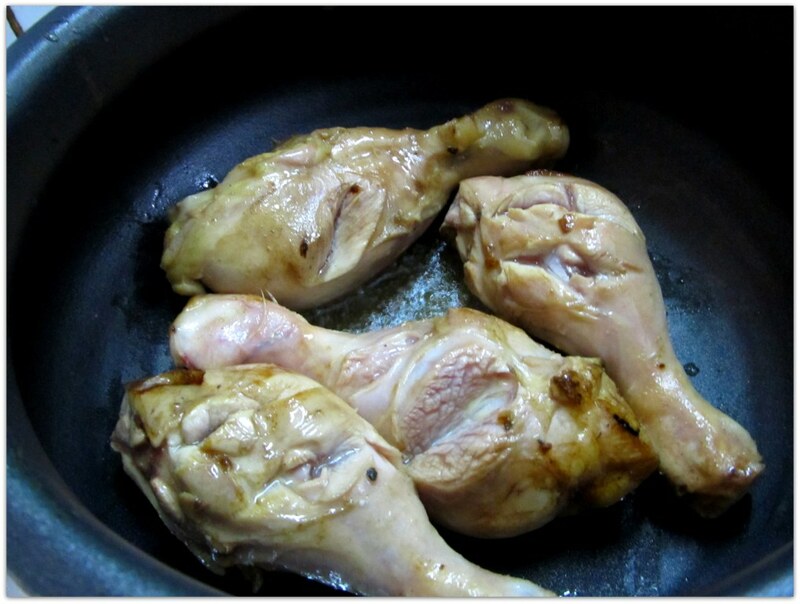 I will be trying your recipe tomorrow….I have one question for you that is….In your recipe you haven’t marinate the chicken. …..is it okk to go without the marinating. ….because all other recipes includes marinating. ….Please do let me know….. I will be trying your recipe tomorrow….I have one question for you that is….In your recipe you haven’t marinate the chicken. …..is it okk to go without the marination??? ….because other recipes are telling us that marination is important……Please do let me know….. Recipe tar jonno oshonkho dhonnobad. Aj eta try korlam. With your exact ingredients, it is just bang on target. Biryani just phataphati hoyeche. Sobai bolbo try korte. Hi Di,, without saffron can i use this recipe??? Hi, you have mentioned Keora & Rose water in the ingredients list but i guess in the method its not mentioned. Thanks for the recipe though! Turned out well. Hello Sharmistha, your recipe is good , but sorry to say .. its not awadhi style biryani. There are some places in kolkatta , like arsalan , and aminia …who claim their biryani to be of awadhi style..though the taste is similar, it feels like something ia missing in their biryani…the best awadhi biryani I ever ate is from a small shop in Lucknow called ” Idris”. I am fortunate to have authentic awadhi biryani recipe which I gained from khansamas of Nawabs in lucknow ,and its not as you described. Believe it or not..they actually call the recipe as Pulao not biryani. Though I cant share the entire recipe I sure can share a few tips…1) they dont use curd or any watery liquid such as rose water or kewra water , the entire recipe is based on oil 2) they use potli ka masala ( khus ki jad , pan ki jad, ashwagandha, joth, Timor, kabab chini, maratha maggu, pathar ke phool etc..) 3) They use pure animal fat along with vanaspati ghee instead of oil 4) The rice is actually steamed in huge steamers and not put into so called “DUM”…which makes their rice extremely fluffy .5) meat balls are used along with meat instead of potatoes and eggs.6) Many prefer to use basmati sella instead of basmati rice . So these are some features of authentic awadhi biryani. She cooks any day with same grandeur. Dunno how. I love u mom. Hey Sharmishtha! !Thanks for sharing this recipe..It turned out really good.. It was super hit. 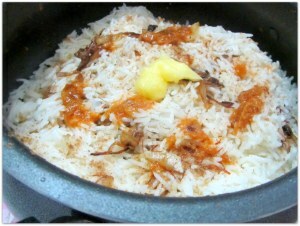 I have made biriyani at home earlier as well, but this recipe is faster, easier and wow taste. Thanks! hello Sarmishtha madam, I m a big crazy fan of biriyani. I have tried ur recepie today. u wouldn’t believe but it was as perfect as u shared. 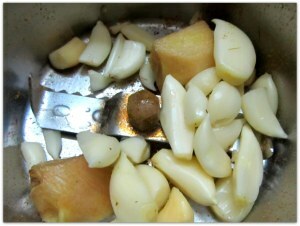 it’s taste was so good and aromatic…thanks for ur tips..
Hi! Really like your very detailed recipe. I am a big time Kolkata Biriyani enthusiast and have cooked a sonewhat of a variation of your recipe here but every time I found the rice comes out “anuni” as in saltless. Did you face any similar problem while following this recipe? If so do you have any suggestions to correct that? While pre-cooking the rice try adding some salt in the water. Can you plz share chicken chap recipie…. i just tried the recipie. it came out to be a brilliant dish. am a bong staying in bengaluru. i appreciate ur method. thanx for sharing. had mah taste buds tingle with the royal kolkata-biriyani. but i faced a bit prob, somewhere in the powder mix of the masala, it came to me a bitter taste. is it of the keora water? Keora water can be bitter if used more. You put keora water in the garam mashala? Hello Sharmistha di, Thanks for this awesome detailed recipe. I have a question, I am going to prepare this for 12 people this Sunday. So the spices should be used in what proportion? And as u said, the Keora water should be used in more quantiy, so how much keora water should be used for 12 people biriyani. Will be very helpful if u reply soon. Thanks again. Hi dear thnx for sharing. I tried this yesterday and it has come out perfect. I followed your instructions completely, including the measurements, so it was very easy. It was beyond my dreams that I would cook biryani one day, but thanks to you it has been possible!! Thank you Sharmistha di. We are definitely going to try this recipe on this weekend and let you know. Second time prepared today following your recipe again. Thank you for so detailed explanation and giving such a good recipe. Just a question, if instead of saffron milk if i use keora water, is it like at every layer i need to give some amount of that ? Or just at the end? Coz i heard adding too much keora water makes the dish bitter. 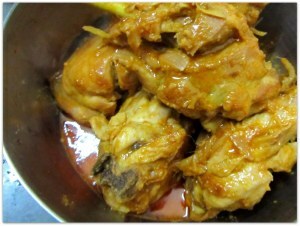 Keora water is for flavor and you should give only in the chicken, not in the rice, and it should be little in amount. Saffron milk is for colour, if you do not have saffron you can use a little bit of turmeric in the milk to get the yellow color. Don’t confuse keora water with saffron. I want to try this recipe. But nowhere I am finding keora water, so any alternate for that? You can get it online. I found one in the link below. how cn we contact wd uh if we wnt 2 join ur cooking classes here in kolkata..?? 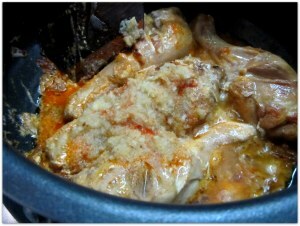 Your recipe is so good and simple.. thanks for posting this. do I need to add salt with the rice? or adding with the chicken and gravy will be enough? You can add little salt while cooking the rice, even some whole garam masala. Thanks for the awesome recipe Madam. I did the recipe as it is the first time around. It came out well but I found it little bland. 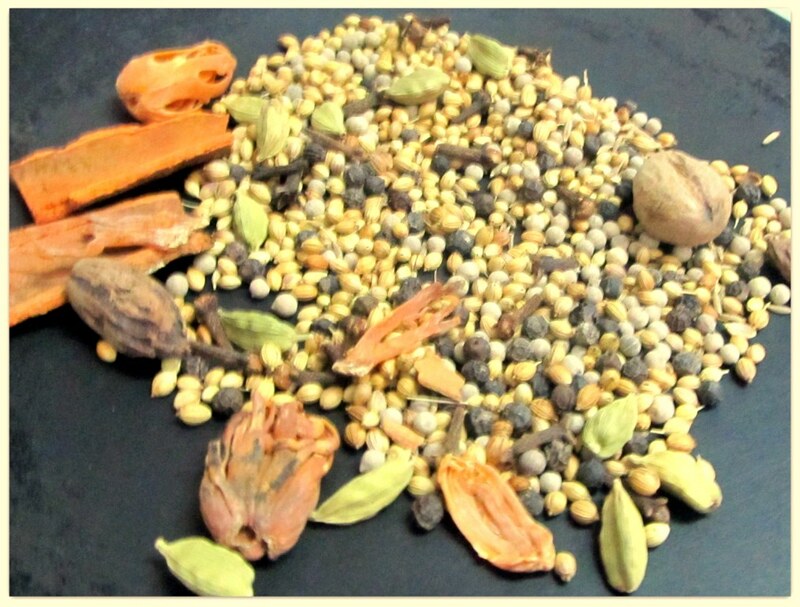 The second time around, I added a single star anise,5/6 marathi mogga and 5/6 paththar ke phool to the spice mix. Also added a cup of coriander leaves and mint leaves. Half the leaves while cooking the chicken and the other half in small quantities between layers of rice. This came out awesome with the Avadhi flavor. The third time around, I grilled the potatoes before frying. Marinated the chicken for 1 hours with half of the fried onions, all the ginger-garlic paste, plain curd, 1 tbs biryani spice-mix, 1 tbs red chili powder, 2 tsp rose water, 1 tsp Keora water and salt. Grilled the chicken lightly before frying. This came out even better. I loved the smoky taste. I love cooking and trying out newer things daily. Thanks for the recipe. I would definitely try this. I did not see where you put the milk with the saffron. Hi, first of all thanks for the recipie. My husband loves biryani the Bengali style and i had never tasted it before my marriage so your recipe helped a lot in making him happy. So thank you again. I don’t know why but I am left with almost soggy and sticky rice and almost no salt T_T please help. It’s the 5th time I am following your recipe. Thank you so much for sharing the amazing recipe with us and make our life easier.. This is my and my husband favourite dish and I keep making chicken biryani on every alternative sunday’s. Once again , thank you so much and I am sorry for late review. 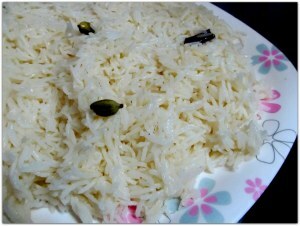 I was curious to know how to make Kolkata type Biriyani…..A big round of appreciation for you to make the recipe look so easy to cook and delicious.I tried this and got a positive nod from my family…I just added two things which you didn’t mention …that is one drop of mitha Athar on the gravy and also used Khoa kheer….The result was fabulous….Thank you so much . Please recommend a heavy bottomed induction kadhai for cooking biriyani. Yummy. Thanks a lot. Tried making Kolkata biryani for the first time and it turned out lovely. I’d give it 5 stars. Don’t get good Kolkata biryani in Mumbai.